A fisherman walks through the boats destroyed by shelling in the Gaza city port. Gaza. 2014. Due to the conflict fishermen were not allowed to fish, they had to fish in the port that has large amounts of gasoline and pollution. Gaza. 2014. A girl sees through the window of what used to be her room. Gaza. 2014. A girl walks in the middle of the destruction caused by shelling in the Beit Hanoun district. Gaza. 2014. Hospital workers that have been working all night, resting in Al-Shifa Hospital. Gaza. 2014. A view of the destruction of the neighborhood of Beit Lahiya by Israeli strikes. Gaza. 2014. A resident of the Gaza district of Beit Lahaya works in front of her destroyed house. Gaza. 2014. A father lifts his son to be relocated from Al-Shifa Hospital to his home, the break of the truce, will bring more new injured. Gaza. 2014. A group of residents in the Shuja'iyya neighborhood in Gaza, go to check and recover their belongings in their houses, and found shells without exploding in their houses, after a temporal cease fire was agreed by Israel and Hamas militants. Gaza. 2014. Gaza city in the days of one of the truce agreed between Hamas and the Israeli government. Gaza. 2014. Residents visit the destroyed homes in Shuja'iyya district, following a truce. Gaza. 2014. 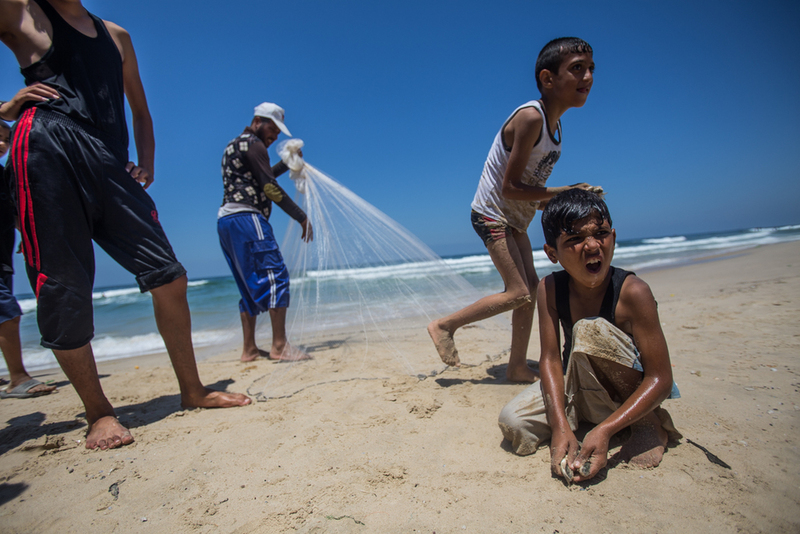 Fishermen prepare the nets for fishing, following one truce arranged by Hamas militants and Israeli government. Gaza. 2014. An Israeli attack is seen in Gaza. 2014. After the truce was broken, Al-Shifa Hospital relocates patients, expecting more injured to arrive. Gaza. 2014. Doctors treat a 2-year-old child, after injuries received at an Israeli air attack. Gaza. 2014. A child in critical condition is seen in Al-Shifa hospital after receiving injuries at an Israeli air attack. Gaza. 2014. A leader of the groups Ilsamist Jihad is taken to be buried after an Israeli strike killed him. Gaza. 2014. A militant fires his AK-47 during the funeral of a leader of the Islamic Jihad. Gaza. 2014. 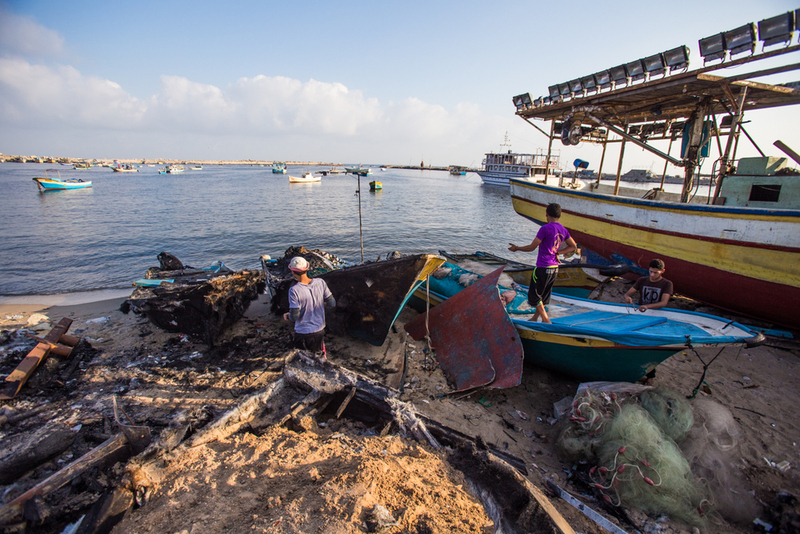 People go to the port to try to find some fish following a truce that was agreed between Hamas and the IDF. Gaza. 2014. Residents return to their homes in the Shuja'iyya district where they found an exploited shell in their homes. Gaza. 2014. A man and his sons rest in the floor of the Al-Shifa hospital, where many have gone to look for refugee during the Israeli Operation in Gaza. 2014. A family is seen in the improvised camp in the Al-Shifa Hospital, where families have sought refuge of the Israeli attacks. Gaza. 2014. A boy watches the destruction of buildings in the Shuja'iyya district. Gaza. 2014. An injured girl from Israeli strikes holds hands with a woman visiting another relative in the Al-Shifa Hospital. Gaza. 2014. A resident visits it house in the district of Beit Hanou. Gaza. 2010. Water and energy supplies were caught off during the 50 day operation of the Israeli army in the Gaza Strip. Gaza. 2014. UN run schools have become temporary refugee camps for families looking refuge from the Israeli attacks. Gaza. 2014. A boy is seen watching the remains of his home in Gaza. 2014. A family sits in front of their destroyed house, from Israeli strikes, in the neighborhood of Beit Lahiya. Gaza. 2014. A family cooks in front of their destroyed house, from Israeli strikes, in the neighborhood of Beit Lahiya. Gaza. 2014. A family drives through the rubble in the district of Beit Lahiya. Gaza. 2014. A child injured in the Israeli attacks is carried to the Al-Shifa Emergency room. Gaza. 2014. A man tries to connect to Internet in his home in Beit Hanoun district. Gaza. 2014. A resident of Beit Lahiya sits in the rubble of a destroyed building. Gaza. 2014. 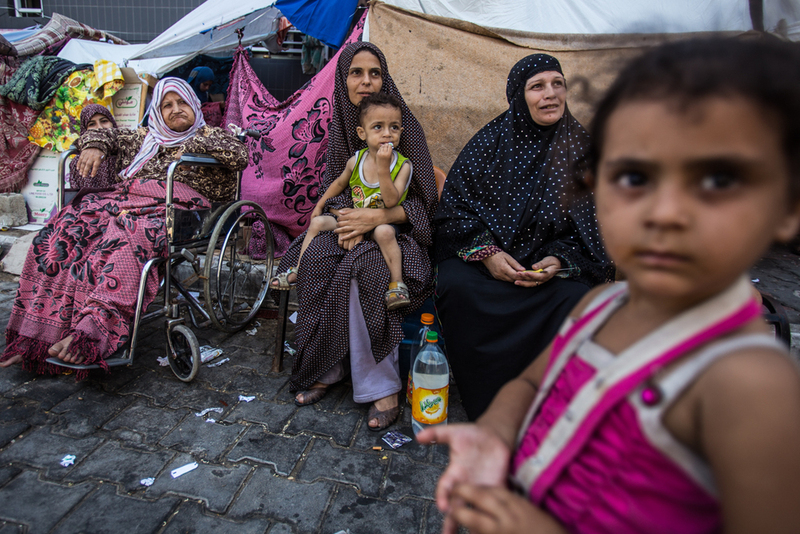 A family waits at the bed of the Al-Shifa hospital. Gaza. 2014. Doctors treat a 4-year-old boy injured in the head in Israeli strikes in Al Shifa Hospital. Gaza. 2014. Graffiti seen in the walls of a destroyed building in Gaza City. Gaza. 2014. 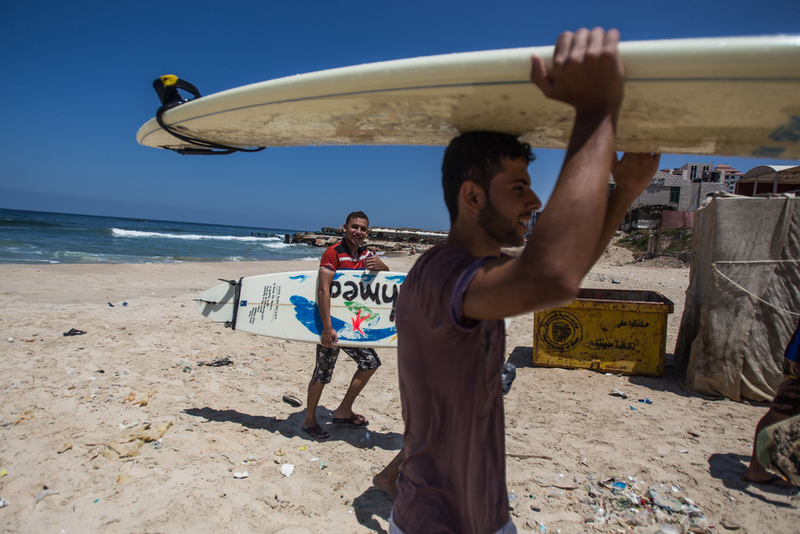 Surfers walk through the beach, following a truce agreed between Hamas and the Israeli government. Gaza. 2014. Israeli soldiers and civilians celebrate in Jerusalem in the Wailing. After another truce was agreed by the two parts. Jerusalem. Israel. 2014. A family is seen moving with its belongings to seek refuge in Beit Lahiya. Gaza. 2014. Fishermen, attempt to fish in the shore, following a truce agreed between Hamas and the Israeli government. Gaza. 2014.